A large (R3D3) natural wet-slab avalanche occurred on the road cut near Bunny Flat trailhead around 3:40 pm this afternoon. 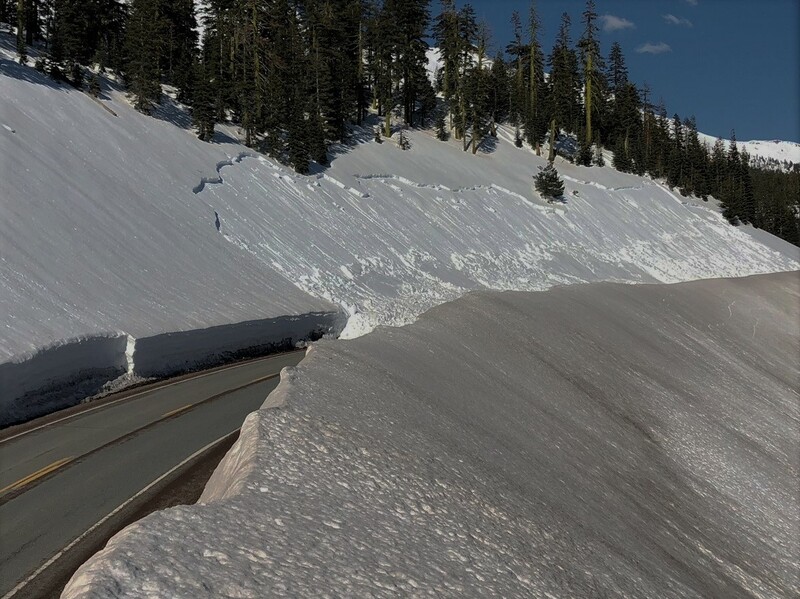 This avalanche was caused by water trickling through melting snow. The water pooled and lubricated a bed surface made of clustered rounded melt forms 3 millimeters thick with a thin (<1 millimeter) ice crust. The slab consisted of wet rounded grains F-4F hard. The bottom inch (2-3 cm) was saturated with water. Dryer rounded snow was found under the bed surface 4F-1F hard. The avalanche ran on a south southeast aspect (154°). The crown ran 150 feet along the slope and averaged 19 inches thick (50 cm). The debris pile filled up one lane of the road 8 feet deep. Tempature have been stedily rising over the last week. High temperatures for the last three days recorded at Sand Flat 6,750 feet are 50, 50 and 53 degrees F. Low temperatures have stayed just below freezing for the last three nights. Little wind has been recorded over the last three days.